DC certainly has a bit of a shaky big-screen history, particularly since Marvel stepped up its game in 2008 (or arguably with the first two Spider-Man films starring Tobey Maguire). While it’s not an improper thought to consider the biggest heroes to belong to the former, the film treatments haven’t followed suit, with exceptions involving Christopher Nolan and either Lego or animated offerings…oh, and Wonder Woman. It’s no surprise that Shazam, without the pressure that accompanies something with the word “Superman” or “Batman” in the name, is as loose and fun as it is, because this one felt like a nothing to lose proposition. Though it’s a little longer than it needs to be and the final fight sequence could easily have been edited down a bit, what you get from this movie is a unique and entertaining experience. It’s so different from anything that DC has tried before, in much the same way as Deadpool was for Marvel, but without all the language and salacious content that accompanied that property. Your expectations likely aren’t that high going in, but you can anticipate the finished product exceeding them, even though this isn’t going to become some kind of go-to that you find indispensable. What it is, generally, is a coherent, relatively fast-paced story of good and evil, and of how one man indeed gained the world, but lost his soul in the process. Yes, I have no choice but to tell you that at the end of Shazam, I felt like I had just watched a subtle, subversive Christian message, but even if you disagree on that point, the message is overwhelmingly positive and uplifting. The movie benefits from its lead star, Zachary Levi, who is one of the more affable members of Hollywood, dating back to NBC’s Chuck, which remains low-key a personal favorite series of mine, or one that’s certainly on the list. Levi plays the souped-up version of adolescent Billy Batson, who becomes a superhero by wild circumstances that I won’t spoil here. It’s a bit hokey of a concept when you watch it on screen, but if you add to it the depth of the struggle between light and darkness, listen to the words being said rather than the bells and whistles that might distract from the overarching point. Batson is an orphan living in Philadelphia (the city is a good setting for the story, and its tourist attractions are used well), and one that has run away multiple times from various foster homes, and has learned how to fend for himself, whether legally or otherwise. He’s a bit of a mischievous youth and trusts no one, but although he’s closed off and very careful and cautious…except when he’s trying to trick the police, his motivations are more immature than malicious. Plus, he desperately wants to find his mother, which leads to an obvious storyline of not appreciating the present, always trying to recapture a past that might not have been what it was cracked up to be in the first place. The foil for Levi is Mark Strong, a talented actor who plays cold, calculated, and unfeeling incredibly well. His character, Thaddeus Sivana, might be a little simplistic in its execution and just how diabolical and stock it feels, but it’s all because the nefarious force in this movie literally, not figuratively, but literally unleashes the Seven Deadly Sins, who exist in monster form…and murder human beings. Again, the symbolism across Shazam is impossible to deny, and drew me into the story in a way it might not otherwise have. Despite the stakes of the battle, this is often a very funny movie, with Levi able to handle the goofy, childlike Batson beautifully. He IS that guy, as Chuck Bartowski and Billy Batson are extensions of the inner-nerd Levi has no problem admitting to being. It’s because of his love of pop culture that he puts forth every effort into nailing the character and seems to have so much fun doing so. As a result, we have fun watching him interact and grow into his powers. A particularly effective sequence shows Batson going through various experiments with his foster brother, Freddy, played by Jack Dylan Grazer, who does a truly excellent job, as does Asher Angel, who plays the actual Billy Batson. 132 minutes is too long for Shazam. If it were more like 112, it would be a better movie, but nothing appears to have been left on the cutting room floor. It’s not that you’ll get bored watching it, but you’ll be ready to get to the ending, because you’ll have a good idea 15 minutes before you get there exactly where it’s heading. The climax absolutely does drag on far longer than it should. Stick through the credits for two stinger scenes…one that’s important and one that isn’t, but it’s worth hanging out for five minutes to check them out. 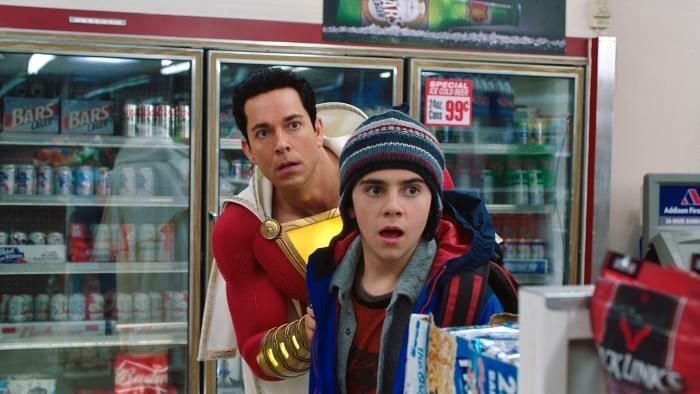 One strength of the movie is undoubtedly the foster family, from loving parents who pray before every meal to the foster children that all have a bit of a unique flare, which serves Shazam increasingly well as they are weaved into the larger plot. Faithe Herman’s Darla, the youngest, will be your favorite (outside of Freddy), as she should be, and you’ll recognize why once you meet her on screen and watch her for a few minutes. Fresh Off the Boat‘s Ian Chen has a couple of great moments as well. While Shazam isn’t an A+, it’s a pretty entertaining couple of hours of superhero madness and humor. It doesn’t take itself too seriously and is approachable, even with some over-the-top craziness going on virtually throughout. The message is what stuck with me and what will make me recommend it. It’s a good popcorn movie that was more consistent than Captain Marvel, though I enjoyed both. Of the two, you’ll have far more fun with Shazam, and you’ll realize why it exists. You’ll also, as you walk out, ask those you saw it with why exactly it didn’t release in mid-December or on Christmas Day. It would have been a perfect December release, as much of it takes place during the holiday season. There’s an unmistakable “If I had one wish, I’d be a superhero” to it, and as the Hollywood Reporter suggested, a new generation Big to be found within the film. David Sandberg (Annabelle: Creation) directed the movie, and his work bears mention, as it really strikes the right tone and balance. I had a good time watching it. Ultimately, that’s what I want from a movie, especially one like this. It’s one of DC’s better offerings in some time, because it doesn’t bog itself down. It could stand to be shorter, the ending could definitely stand to be condensed, but it doesn’t wear out its welcome. There’s minor language and a little violence, but the family can enjoy it. The message is one you can discuss with your kids as well…and you’ll have fun with the film as an adult. It’s a solid B-…the “-” is for the length and the overdone last 20 minutes or so that seems endless.